Elbow Cable Glands are manufactured from Brass, Stainless Steel, Aluminium, Nickle Plated Brass, Copper, Polyamide and other material composition as per custom requirement. 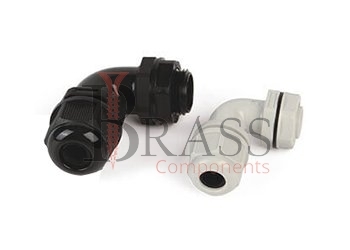 The manufactured range of Elbow Cable Glands are compiled to meet the BS: EN 50262:1999 Standards. Elbow Cable Glands are liquid tight and strain relief with wide clamping range. 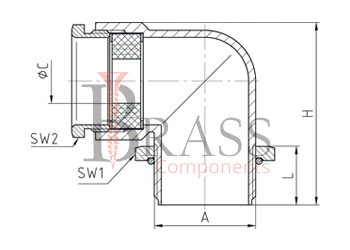 Elbow Cable Glands are available in PG, NPT and Metric Threads. Elbow Cable Glands enable cables to insert or install safety to the equipment around required angle. They are screwed tightly on the cable assembly and provide high strength connection and installation. The Standard Range of Elbow Cable Glands provide low smoke and zero halogen seal onto the cables outer or inner sheath. Depending on variety of Applications, Elbow Cable Glands are available with different types of cable gland accessories including Lock Nut, Serrated Washer, Earth tag, Reducer, Adapter, Neoprene washer and more. Resistant against corrosion and vibration. CE, UL and cUL Approved Elbow Cable Glands. Can attach with special seal and spiral bending protection nut to increase many type of capabilities. Elbow can be straightened for easy cable insertion and installation. Provide protection against ingress of dust, water and other substances. For Installation areas with small amounts of space due to construction. Suitable for outdoor use to UV light exposure and water immersion. We manufacture Elbow Cable Glands as per Custom Specification and export in Germany, Spain, Netherlands, Portugal, UK and other European Countries. For more Information, Please Contact Us or Inquiry Now.